Today I had the solemn honor of participating in a memorial service to commemorate the tenth anniversary of 9-11, at St Andrew’s Church in New Plymouth. Led by my friend the Reverend Kim Francis, the memorial drew more than 500 Kiwis, Americans, Irish, and others to pray, sing, remember, and show solidarity. 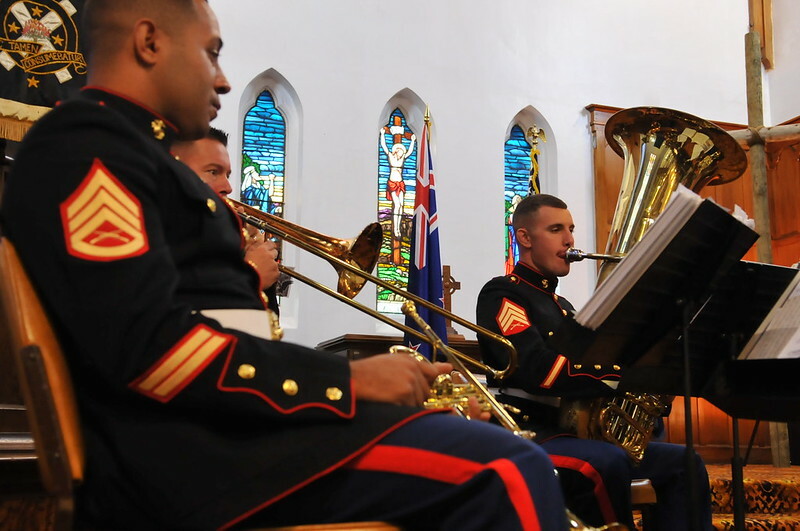 Our Marine Band joined St Andrew’s choir to provide music. I was joined at the front of the congregation by the entire USA Eagles team and other special friends including Mayor Harry Duynhoven and the Mayoress, MP Jonathan Young, and my colleagues Ambassador Frankie Reed, Special Representative Reta Jo Lewis, and ANP Desk Officer Michele Petersen. Today is a challenging day, but the juxtaposition of solemn remembrance and exuberant sport is not as discordant as it may seem at first blush. It is essential that we remember the 3,000 people murdered on 9-11, but it is equally essential that we celebrate the resilience of the human spirit and the courage and strength of communities visited by tragedy. So we carry on. There are rare days, maybe once every few generations, that galvanize the collective hearts and minds of humanity. Days that dispel in a flash the billions of distractions of everyday life … that boil off, even if only temporarily, the political, religious, national, and cultural pretenses that we humans create to separate ourselves from each other. Days that resonate deep inside us where the common core of our humanity exists, rather than on the surface where we live most of our earthly life. 9–11 was one of those days. We watched live on television the brutal murders of 3,000 human beings from 90 different nations. They were people of all religious beliefs, all political viewpoints, young and old, men and women, gay and straight. They were murdered by those preaching hatred, simply to instill fear. And we reacted with near unanimous horror and sorrow. The perpetrators of the carnage would wish us to relive that horror and feel that fear as we mark the tenth anniversary of the events of September 11, 2001. What we commemorate today, however, is not the fact that remorseless evil lives among us, something that even the most blinkered moral relativist already knows in his heart. Instead, we commemorate the triumph of the human spirit … the common humanity, empathy, and self abnegation that set us apart from the other species on this planet. We commemorate those police, fire, and rescue workers who raced into – rather than out of – collapsing buildings. We commemorate those regular citizens who carried – rather than trampled – strangers as they themselves struggled down burning, smoke-filled, crumbling stairwells. We commemorate the passengers of United Flight 93, including two American rugby players, who battled the hijackers in the aisle with coffee pots, cutlery, and shoes, broke into the cockpit, and crashed the airplane into a field in Pennsylvania, thus averting the destruction of the terrorists’ intended target, this planet’s iconic symbol of democratic self-determination, the US Capitol Building. We commemorate those who survived the attacks, including my brother Rick, who was at the South Tower when the airplanes struck the World Trade Center. And we remember all those we lost and their families and loved ones … not only those lost in the American Northeast on that day but all those lost on other days in Madrid, London, Bali, Nairobi, Dar es Salaam, Mumbai, Oklahoma City, Oslo, Jakarta, Manila, Kabul, Lahore, Baghdad, Kigali, and far too many other towns and cities. But today, beyond sadness, we also commemorate, honor, and indeed celebrate the resilience and determination of communities around the world that have suffered attacks by violent extremists … communities that have pulled together and demonstrated that they are stronger than fear. We commemorate, honor, and indeed celebrate the many people around the world working to prevent new attacks, to confront and overcome violent ideologies, and to address and combat the circumstances that create breeding grounds for violent extremism. And finally, and I think most importantly, we commemorate, honor, and indeed celebrate what violent extremists themselves fear most: the great human instinct toward empathy, kindness, and solidarity. As I find is often the case, the most trenchant commentary comes not from those who peddle words for a living. And the best example is found not among those who presume to lead from a safe, comfortable, and convenient distance. “My son TK (who will be 4 years old next week) watched as the American flag outside the American Embassy was put to half mast yesterday morning. The Embassy is across the road from TK’s crèche, and after the flag was lowered, he asked why. “His teachers explained to him that it was because lots of people had been hurt, and then the teachers suggested that the children take flowers over to the Embassy as a mark of respect. “TK proudly carries his purple flowers forward and placed them beside the flag, then stood back and waited while his friends did the same. He waited, eyes on the flag. When his teachers told him it was time to go, he started crying. The teacher asked what the matter was. TK had thought that by putting the flowers under the flag that would make the people better and the flag would therefore rise again. Yes, TK does have a very kind heart. And he’s not alone. There are millions of TKs out there, and they stepped up on the darkest of days when we needed them most. It is in nurturing, protecting, and empowering those kind hearts that we find our best hope for building a positive legacy from the events we remember here today. Kati ake i konei. Ma te Atua koutou e manaaki. Image published by US Embassy New Zealand on 2011-09-11 00:15:53 and used under Creative Commons license.